May 25, 2018, 9:38 a.m.
Also, has the “fake news” moment already passed for academics? By Rasmus Kleis Nielsen @rasmus_kleis May 25, 2018, 9:38 a.m. I am at the International Communication Association 2018 annual meeting in Prague. It is arguably the single most important international academic conference for communications research, media studies, and, by extension, work on journalism. The ICA papers — most of them work-in-progress, fresh, recent, up-to-date work by a wide range of academics studying journalism from many countries, perspectives, and backgrounds — can provide the basis for at least a partial answer to an important question: What is the field of journalism studies actually studying today? The results are below. I categorized the 130 accepted papers by their title, and collapsed all topics with less than 5 papers into “other.” Because most codes have only 1 or 2 papers, this account for a large share — almost half. Please note that I coded only the full papers, not panel submissions — if we take these into account, including four full panels more or less directly related to discussions around “fake news” and “post-truth” etc, the overall picture is different, with various “fake news”-related papers then constituting the single largest group. Because panel submissions are based on short abstracts, I would say they constitute expressions of academic intent — whereas full papers, which require a whole lot more work, constitute revealed preference, what academics have spent months of effort on. Crudely put: Panels are what we’d maybe like to do; papers is what we have actually done. In line with the thrust of the field at large, inequality and other barriers means that the bulk of the presentations are from and focused on high-income democracies, so there is a whole range of issues around state censorship, freedom of expression, violence against journalists, media capture, and other pressing issues that are largely absent. Has the “fake news” and “post-truth” moment passed already? (Or at least not found favor with reviewers?) 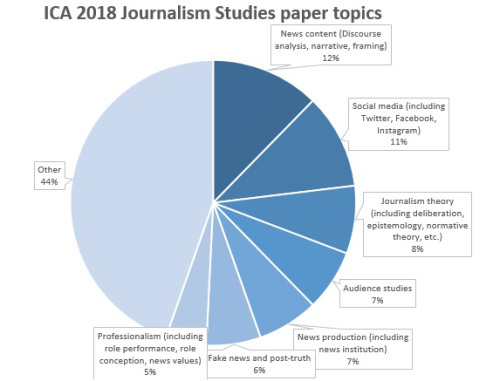 At the 2017 Future of Journalism conference, 17 percent of all papers included some mention of these terms in the title; at ICA, the figure for full papers is 6 percent. (As noted above, the picture gets more complicated if we count the panels on this theme.) Will this, like “citizen journalism” before it, will turn out to be more of a short boom driven by public and professional interest than something clearly anchored in academic work? 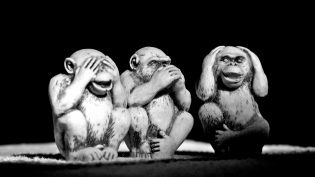 Given how little empirical research we actually have on disinformation in many countries, and how urgently such work is needed to inform policymaking and industry responses (whether from the European Commission or from private companies like Facebook), if the moment has passed, it may have passed too soon. There’s a lot of work on social media — most of it on Twitter, perhaps because of the availability bias, much less on Facebook and Instagram, and a few on Chinese social media platforms. Most of this work is focused on social media content and social media use by professional journalists (for distribution, sourcing, audience engagement, etc.). Very little work, as far as I could see, is on the institutional implications of the rise of platforms. This is an issue I’m personally very focused on and think is a defining issue of our time (see, for example, here). Compared to the Future of Journalism papers, many more of the ICA papers are directly and identifiably rooted in established, longstanding areas of work in journalism research, including various forms of content analysis (discourse analysis and especially framing), news production, and professionalism. They are much more likely to explicitly evoke theoretical approaches (deliberation, mediatization, etc.) or directly connect with other established areas of academic research like audience studies. Apart from one paper with the phrase “political economy” in the title, I could not find any work on the business of journalism. I find that extraordinary, and extraordinarily troubling. The business models that funded most of journalism as we knew it are being fundamentally challenged by the move to digital media, the proliferation of choice for both audiences and advertisers, and the rise of platform companies — and yet while this underlying structural change influences so much of what journalism studies study, very few seem to study the change itself, how it plays out in different countries, or indeed how research might inform how the industry and the profession respond to this change. Many countries are looking into the sustainability of professional news production — for example, in the U.K. through the governments’ Cairncross review of the sustainability of high-quality journalism. If we want to be part of such important policy discussions, we need to engage directly with the underlying questions and bring independent, relevant, and robust evidence-based work to bear on them. For other issues — including around trust, partisanship, and information inequality, as well as forms of discrimination around gender and race — I found more ICA papers than I saw at the Cardiff conference. More broadly, journalism studies as a field overall seems more focused on studying journalists themselves — their work routines, their professional identity and role perception, the content they produce — than on studying the institutional relations (with audiences, business, technology, politics, etc.) that constitute journalism. and could bring a lot more to public debate, public understanding of the issues of our time, and policymaking if we tackled these issues more often and more directly on the basis of independent, relevant, evidence-based work. Many thanks to Keren Tenenboim-Weinblatt for sharing a spreadsheet with all accepted papers and some further context, including pointing me to the four panels on “fake news” and “post-truth.” She bears no responsibility for the analysis or the post. Rasmus Kleis Nielsen is director of research at the Reuters Institute for the Study of Journalism and serves as editor-in-chief of the International Journal of Press/Politics. 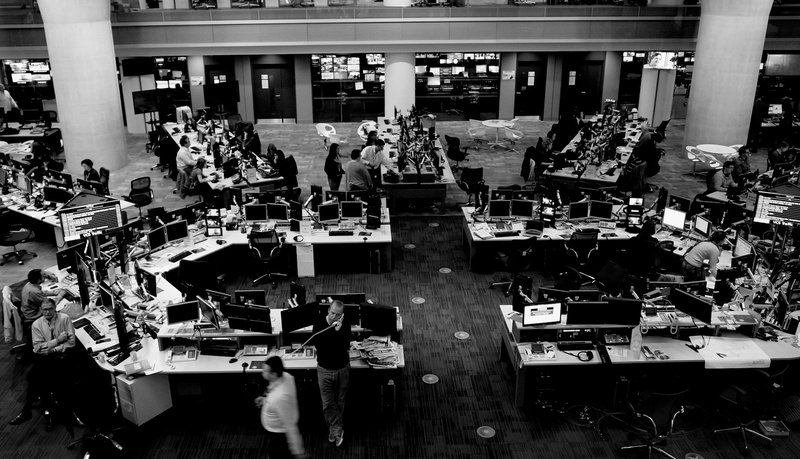 Photo of the BBC newsroom by Graham Holliday used under a Creative Commons license. POSTED May 25, 2018, 9:38 a.m.
Nielsen, Rasmus Kleis. "What is it that journalism studies is studying these days? A lot about newsrooms, less about everybody else in the news ecosystem." Nieman Journalism Lab. Nieman Foundation for Journalism at Harvard, 25 May. 2018. Web. 18 Apr. 2019. Nielsen, Rasmus Kleis. "What is it that journalism studies is studying these days? A lot about newsrooms, less about everybody else in the news ecosystem." Nieman Journalism Lab. Last modified May 25, 2018. Accessed April 18, 2019. https://www.niemanlab.org/2018/05/what-is-it-that-journalism-studies-is-studying-these-days-a-lot-about-newsrooms-less-about-everybody-else-in-the-news-ecosystem/.